This past January I embarked on a Saturday reading plan of the Dogmatics. Now roughly halfway through the fourth volume and on track to complete the set by the end of December, I can safely say this is one of the best decisions I’ve ever made in my theological life. Bavinck’s accomplishment in the Dogmatics is nothing short of jaw-dropping. The expansive, nuanced, and deeply trinitarian theological vision is both intellectually challenging and spiritually nourishing. I anticipate turning to these volumes regularly in the years to come. I’d like to offer up six reasons you ought to consider picking up the Dogmatics and working through them yourself. 1. Eminently Biblical. Obviously, the pre-eminent mark of any work of dogmatics that aspires to the name “Christian” is its biblical character. Bavinck is second to none in this regard. Each and every subject is first developed according to the relevant biblical materials. Bavinck doesn’t restrict himself to mere proof-texting, but enters into complex philological debates, issues of historical context, and the redemptive-historical development of an idea as it unfolds across the testaments. In many cases, I was amazed at his nuanced discussions of subjects much-debated in current scholarship, such as nature of the “righteousness of God” or the eschatological nature of the kingdom of God. He anticipated such 20th-century developments by at least 75 years. 2. Historically Grounded. Bavinck appreciated the importance of addressing the history of theology when formulating doctrine for the present age. As a result, each section functions as a crash-course in the history of the development of the doctrine. After a discussion of the biblical material, Bavinck proceeds to examine patristic developments both East and West, medieval sources, Reformation debates (both Protestant and Catholic), and modern Protestant liberalism. All of the major debates are covered, and detailed arguments for various historical positions are developed at length. While there have been some correctives in late 20th-century historical theology, the Dogmatics are still going to be worth consulting for students interested in more than contemporary perspectives. 3. Broadly Catholic. Despite its clear Reformed emphasis, Bavinck’s theology is broadly catholic in the best sense of the term. He’s well-attuned to the riches to be discovered across the wider Christian heritage. Indeed, Augustine and Aquinas appear to get more play in his doctrine of God than Calvin, Luther, or even later post-Reformation sources. 4. Irenically Polemic. Bavinck’s method involves lengthy, charitable expositions of viewpoints he wishes to dispute—Roman, Lutheran, Remonstrant, Socinian—so that he might, by contrast, better develop the unique strength and nuance of the Reformed position. Bavinck writes with a generous spirit that makes him slow to cast anathemas. 5. Philosophically Sophisticated. 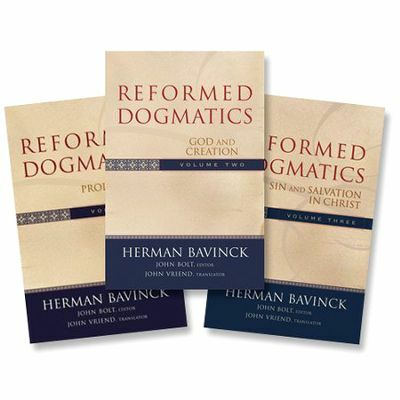 In the Dogmatics Bavinck engages philosophical views on every level on a wide range of subjects. In this respect he’s like Barth but about 30 years ahead of the curve. The first volume of prolegomena deals extensively with epistemological issues, in a number of places anticipating contemporary developments. And Bavinck’s development of the relationship between nature and grace along covenantal lines (in contrast to the Roman Catholic donum superadditum) is a largely untapped reservoir for those tempted toward Radical Orthodoxy or the 20th-century Nouvelle Theologie. 6. Reformed Theology as Tradition. Bavinck was keenly aware of his position as a theologian situated within a particular tradition. As such, reading his expositions of the Reformed approach to a given problem begins to give the Reformed theological student, especially a novice like myself, greater appreciation for the tradition as a tradition. It is a conversation between theologians with shared basic convictions and questions, but with differences, nuances, and important variations. One of the most memorable instances comes when Bavinck quite clearly, but gently, accuses Jonathan Edwards of inadvertently giving aid to the Pelagian revisionists in his own theological controversies. Because of the time commitment required to read these volumes, I’d recommend putting a reading plan in place. I made a plan at the beginning of the year to read at least 30 pages every Saturday, or up to a chapter a week. You many want to break it up into chunks of five pages a day. In any case, reading plans help turn large books into collections of smaller books. Finally, you might be worried that it’s theologically above your pay grade; even the brief descriptions of his strengths may strike you as intimidating. I’ll admit, Bavinck isn’t for the beginner. But for all who consider themselves students of theology—certainly seminarians and Bible students—you should be prepared to challenge yourself regularly. Straining to read above your current level of understanding is one of the only ways to grow. And Bavinck is a wise, thorough, surprisingly accessible teacher even if he does engage at the highest levels. For the still unconvinced, pick up this abridged, one-volume edition of the Dogmatics that is far more approachable. For those looking for more resources, hermanbavinck.org is a treasure trove of links to free articles by Bavinck and helpful secondary literature.